Now that Microsoft’s Visual Studio 2017 is generally available, software development solution providers are taking the necessary steps to support the latest IDE. Component solution provider GrapeCity is the latest company with the announcement of ComponentOne Ultimate 2017 v1. 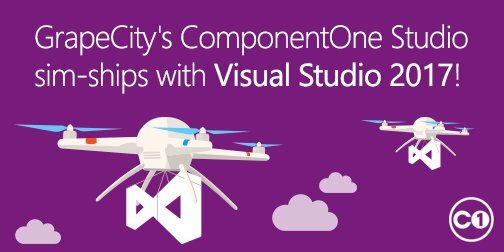 The cross-platform component suite includes ComponentOne Studio, Wijmo, and Xuni. This is the company’s first major release of the year. It features improved developer controls across data management, data visualization, scheduling, input, editing, navigation, layout, reporting, and document generation as well as full integration with Visual Studio 2017. ComponentOne Studio’s FinancialChart control is being updated with five new indicators and overlays such as the MACD indicator, stochastic indicator, bollinger bands overlay, envelope overlay, and Fibonacci tool. The studio is also getting two new chats (box-and-whisker and ErrorBar) as well as three chart features for FlexChart (axis binding, sunburst chart and multiple plot areas). The company’s native mobile controls suite for iOS, Android and Xamarin is getting new Xamarin controls. Xuni will feature UWP support, FlexGrid, input gauges, CollectionView, and calendar capabilities. These features will be available in a beta version until the summer. In addition, the DataEngine component of Web API has left beta. It allows users to analyze data from multiple data sources. The API is only available with ComponentOne Studio and Ultimate. Other features of the release includes InputPanel for WPF and UWP; new FlexChart chart types and features for WinForms, UWP, WPF and MVC; GanttView for WPF; MultiRow Data Grid controls for ASP.NET MVC; and the FlexViewer mobile. Full details about the release are available here.